Hello everyone, and thank you so much for following along on our epic journey across the United States. It has been such a life changing experience and thanks to blogger we will get to keep our memories here online forever. Years ago before the invention of digital cameras and blogs people didn't have the capabilities that we do today and I am so grateful that we do! To know our memories will always be here at The Zen of Ken and Jen pleases me to no end! I am sure Ken and I will be looking back at this blog until we grow old. 1. Talking about Alex and honoring her memory. 2. The countless random acts of kindness that renewed our faith in humanity. 3. Seeing Simon transform into a happy little dog. 4. Meeting so many every day heroes who are now my new forever friends. 4. The horses running along beside us, especially at sunset. 5. The embrace of silence that was often only interrupted by birdsong. 6. Feeling myself becoming stronger, physically, mentally, and most importantly, spiritually. 7. The deeper sense of awe and love I now have for my country and the people in it. 8. The steady feeling I now have that tells me no matter what, everything's gonna be okay. 9. Knowing that people's lives were being saved by those who signed up to be donors. 10.The generosity of the people who donated to our cause and made our ride possible. 11. Meeting Dillon and his family. 12. Listening to Alex's heart beating in Dillon's chest. THANK YOU ALL SO MUCH FOR HELPING US MAKE OUR RIDE A HUGE SUCCESS!! Ken's rear wheel suffered a fatal break about half way between Eugene and Florence, and we had to get a ride from a farmer named Mike. His sister Sheryl lived just down the hill from where we had turned our pedals for the last time, so Ken walked down there and asked for help. These folks were characters! Sheryl called both her brother Mike and her father Jerry and soon there were a bunch of us putting stuff into the back of Mike's truck. Mike is building his own tadpole trike so he was interested in our trikes and our experiences riding. Ken and Mike had lively conversation as we made our way to Florence, while I lay in the back seat trying not to vomit. I get VERY car sick, even when I take my medicine for it. When we got to the coast I could hear Ken saying, "There's the ocean, Jen" but I was so ill I couldn't even get up to look at it. We found a campsite and unloaded our things, said thank you and goodbye to Mike, and the moment Ken set up the tent, I went to sleep. I woke up to it raining and it would be two days of that before I would even see the ocean that I could hear roaring from just a two-minute walk away. Finally on Friday the clouds were gone as was most of my sickness so we took my trike down to the water and dipped the tires. There were lots of sand dunes. Lookin a little like Magnum there, Ken. WE MADE IT!! Coast to Coast. This marks the official end of our cross country trike trek. Next Spring, however, The Just BeCauses TerraTrike Tour will resume as we head down the Pacific Coast. We plan to ride every Spring for many years to come, raising awareness and enjoying our country, and maybe some other ones too. Stay tuned for a couple more posts, and then this blog will come to end when we arrive in South Fork, CO where we will spend the winter. You can find us there at the Foothills Lodge and Cabins, and we invite you all to come ski with us!!! Thank you all SO MUCH for following along with us on our journey. And for the donations so many of you made along the way. This was truly a group effort, inspired by Alex, encouraged by friends and family, and blessed by Izzi. Thank you all! McKenzie Pass. Elevation 5325. 15 miles of uphill climbing. 23 miles of glorious descent. And at the top, the most unique summit of the trip. It was also our last pass making it pretty much all downhill from here to the coast. The road had been newly paved and there were hardly any cars. It went from trees to rock as we got closer to the top. At this point we saw the lava fields. Miles of miles of what looks like rubble. It was unlike anything I've ever seen, or even heard about. 1500 years ago all of this was a sea of red hot lava! At the top there was a castle-like structure made from the lava rocks. Inside there were big curved windos and in between them were tiny windows, each with a name written below it. The name was indicative of the mountain you could see through the window. All the way around, there were 11 different peaks you could see and identify with the help of these little windows. Hard to see but in real life it wasn't. Ken takes a look at Mt. Washington. 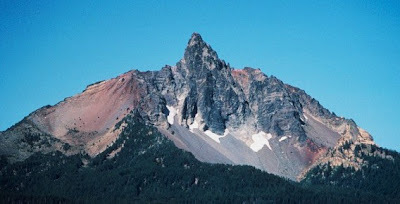 It had some minor volcanic activity as little as 1330 years ago. For years this pass was closed for construction. They had only recently reopened it. Simon couldn't find any grass. It was also COLD and windy there! As we began the descent, things started to become more green. We thought it would get warmer but it really didn't until we were down below 1000 feet again. It got VERY green, and the 23 miles to the bottom was nothing short of magical. The forest here was so lush and dense, it was like something from a fairy tale. The road was smooth and winding and we had it all to ourselves. We camped that night at a campground appropriately named "Paradise" where there were enormous trees covered in moss, and the rapid McKenzie River ran beside us. I didn't get many pictures of this part. I was too busy saying, "Weeeeeeeeeeeeeeeeeeeee!" It was so much fun!!! Knowing McKenzie was our last pass to conquer made it even more fun. From this point on, things got sort of hectic. The next day we were back in traffic and we got rained on until we arrived in Eugene where we got a room. Everything was soaking wet and covered in road grime and we were miserable. We admitted to one another that as sad as we were about the trip ending, we wouldn't miss this part. Getting soaked, breaking a wet camp, and riding on a dirty busy road isn't fun. The next day we headed for Florence... Our final destination. We would arrive there, but not in the way we'd anticipated for oh so long... stay tuned!